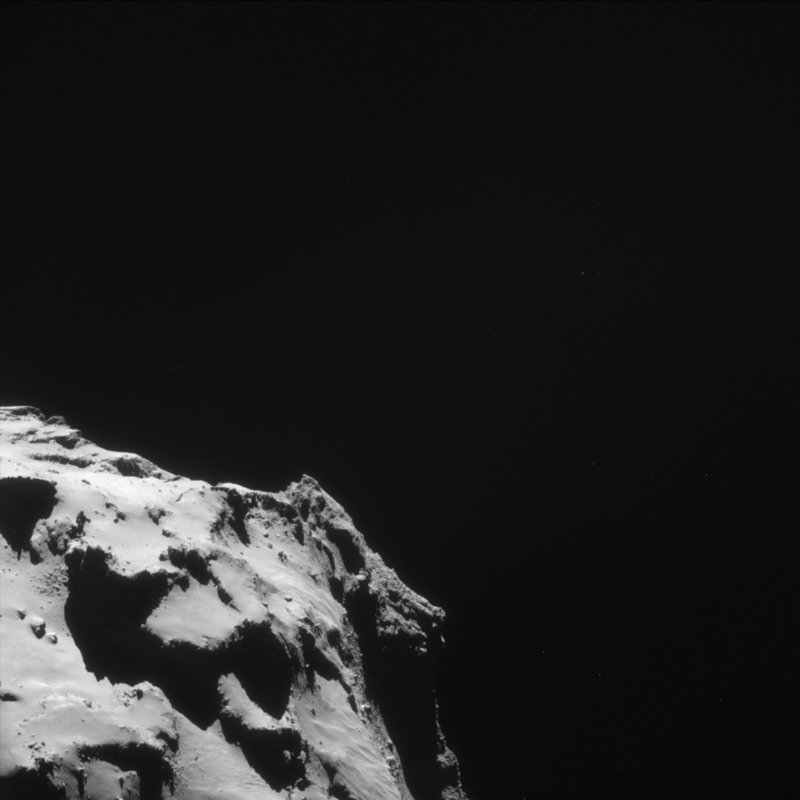 This four-image mosaic comprises images taken from a distance of 20.4 km from the centre of Comet 67P/Churyumov-Gerasimenko on 9 December. The image resolution is 1.74m/pixel and the individual 1024 x 1024 frames measure 1.8 km across. The mosaic is slightly cropped and measures 2.9 x 2.7 km. As usual, rotation and translation of the comet during the image sequencing makes it difficult to create an accurate mosaic. In this particular instance, some distortion terms were introduced to make the mosaic, but careful inspection will show slight remaining mismatch errors at one of the peaks on the top edge of the mosaic and at the limb of the comet on the right-hand edge. Some cleaning has been applied to lower the impact of NAVCAM scattering and make the boundaries between images continuous. So, be cautious in pushing the intensities too far to look at very faint features: there will be some artefacts. The lower left part of the mosaic has some particularly interesting features. Towards the left of the smooth neck region, there are a series of curved trough-like features. The longest of these features, at the bottom of this set in this orientation, is reminiscent of the feature close to the Cheops boulder.The same features are also just visible in the image published earlier this week, towards the centre of the frame, but the image presented here provides a much clearer view. However, it is difficult to spot these particular features in earlier images (e.g those taken on 2 Oct and 20 Oct), suggesting that changes may be occurring on the surface. That said, changes in viewing angle, illumination conditions, and image resolution could also be responsible, and a more detailed analysis at high resolution and over a wider range of viewing conditions will be needed to see if these features are changing in appearance over time. Towards the right of the neck region, you may also spot what appears to be a chain of small pits – these were also identified in earlier images, and almost give the impression that perhaps a boulder has bounced and rolled along a linear track. Finally in the same region, towards the bottom left of the mosaic, brighter cliffs also stand out against the darker background, seemingly devoid of the dust that covers the majority of the comet’s surface. Of course, the rest of the mosaic offers incredible views of the comet’s surface details too, and the region at far right gives another look across the large depression that the 7 December image set focused on. As mentioned previously in the blog, a full geologic interpretation of the comet’s features and evolutionary processes will be made available by the Rosetta science teams via peer-reviewed papers in due course. The individual image frames are provided below. Hi Emily and H. NAVCAM team. Material displacements again, like those ‘close to the Cheops boulder’. ‘Something’ is flowing under there. Could it be going under at the trench walls? Like old stars, could comets with good look just slowly deplete and colapse? Are carbonaceous asteriods just ‘oldies’ among comets? Those ‘savannah’ tree drawings over the smoother surface, could it be organics dust flowing down by gravity? Once again, zero evidence of nozzle-like vents which is needed to account for the quantity of jets being produced all over the neck region. I’m sorry folks, the sublimation model is dead and ESA is doing an injustice by not publicly announcing these issues or its investigation. It’s presented as if everything we thought a comet was is what we’re seeing, confirming only what we ‘knew’. So, Ross, you reject Jean Crifo’s hypothesis? You know, the one where jets are produced by the interaction of broader fans of emission? Is it just me, or does anyone else see a caricature of Richard Nixon staring out of the right side of this image? I think it’s just us Bruces, Bruce. Maybe not specifically Tricky Dickie, but certainly the face of a dubious character. That was the very first thing I thought when I saw the mosaic. I was tempted to blend a photo of Nixon into the comet there, but decided it wasn’t worth the time because I figured no one else would see what I saw. Coming back and reading your comment saying the same thing makes me feel a lot less weird. Some dust to space. A little more to surface. But most of it is ‘eaten back’ trough its cellular body. Many interesting changes on the North Polar Plain have happened since October, November and these 9 December Navcam images. Excellent work that Bill. The change bottom left of the neck plain was immediately striking. That depression has got deeper, dust appears to be flowing down into it and three new scarps have appeared. What is also evident is that the thickness of the dust layer is much reduced. More subsurface terrain is visible all across the neck, more cryorocks have been revealed and the surface appears a lot rougher. The body lobe side of the trench shows lots more exposed “dust” free areas and even though Ross claims he can’t see any, there are many more pits and holes evident in the subsurface material. On the head lobe trench wall, right at the top is another “cavern” almost directly facing us. In front of this massive cave mouth is a very bright ledge which is generating a plume of dust and gas visible against the dark cave mouth background. Alright so this is not a massive streamer, but it is a direct view of source and fountains of dust leaving the surface. All along the horizon of both lobes, the faint haze we saw a few weeks ago has now turned into a solid mist of dust and gas above the surface and I notice even the darker areas of surface layer have faint halos round them now. Previously we only saw this around exposed cryorock and very light coloured surface dust. This surface halo material does not seem to have enough energy to reach the extended coma and I wonder if a large amount of it condenses back onto the surface as the comet moves away from the sun again. At this current increase in the rate of surface dust loss, the comet could be stripped bare by this time next year. Before 67P moved closer to the Sun the surface dust layer might have been many metres thick all over the comet. Looks like surface “changes” could be nothing more than image angle changes, altitude changes, time of comet day, seasonal lighting change. ?? This nucleus is very sharp angled and irregular and the slightest change from camera perspective casts light and shadows in ways that can trick the eye .. I believe! No… that’s true as a general principle, but does not apply to these features, which are much too prominent, sharp and clearly defined. Well this image provides yet another view of Philae’s first touchdown and another opportunity to examine where she might have travelled. So I got my coloured crayons out again to see what emerged. Again these images are not meant to be a representation of reality, but just to give an idea of what may have happened using the few clues publicly available. The first image just highlights the touchdown point and a possible contact point with the crater rim. The different orientation takes some getting used to. Of particular note is how bright the area of the first touchdown has become compared to the surroundings since Philae landed a month ago. The second image has the approximate and guessed flight paths added. More details about my thoughts and reasoning are contained in the image descriptions. The key understanding I got from this exercise is that the glancing touch on the crater rim didn’t have to alter the trajectory that much for her to reach the CONSERT defined search area. The tricky bit is accounting for the hour and 6 minutes of the second part of the bounce. Either Philae lost a lot of speed, or a significant amount of her velocity was converted into vertical motion. Since after this point Philae was tumbling head over heels, I tend to think that would have absorbed a fair amount of the vertical component and the first possibility is the more likely to be the dominant factor, especially bearing mind the very small second bounce. In plotting the green line a higher trajectory made it more likely to hit the rim wall again. A second less significant glancing blow was suggested by the ROMAP team about 7 minutes before the second touchdown and the trajectory I suggest does come very close to two little peaks right at the top of the crater rim just before the rim wall is broken by a sharp cliff down to the small gap just above the second landing zone. However I think they would be too far away for Philae to travel the remaining distance in 7 minutes. An outcrop on the side of the head below the rim, or the point where the valley drops over the side of the head would seem more likely. The more I look at all these possibilities the more amazing it becomes that Philae landed on the head lobe again at all, let alone on a skinny finger of surface sticking out from the side of the head. Nearly everywhere else around the rim of the head lobe it is at best a straight drop, or more usually a serious overhang above a straight drop, to the neck and body lobe below. I just hope Philae has not used up all her luck. Fabulous piece of work as usual. I wish esa had put some sequences together instead of just pictures. Thank you very much for sharing, excellent. I will now spend some time studying. Perhaps we should rename Santa to Bill. In this august 20th link, the track back to the cavern isn’t discernible but it must be there because it’s visible in the later picture in this post. The tracks that are also visible in this current blog post are shown from above, fanning out from what appears to be a single common track. Inside the cavern you can see darker patches that are roughly the size of the boulders that have escaped so I wonder if they dropped out after the levels dropped away. That whole area looks like a sandy beach with a cliff at the back that’s been eroded in a storm. Obviously that’s not the process that’s caused it to appear this way but it suggests that the level of the smooth dusty neck has dropped and loose boulders have dropped out of the cliff face as and when they are exposed. No soul seems to be using ‘craters’ anymore. What about ‘thermal scales’. [Cheops plains looks like impact crater, nowadays]. There is a suggestion above that makes a great deal of sense. Could some time lapse sequences be prepared showing the same area, ideally from a similar angle, even more ideally under similar illumination, to show what changes are occurring? I would think there are sufficient photographs now this would be possible. This would have real scientific value, as well as being of great interest here. Any chance ? – Merry Christmas and thanks for your posts.